It is common to use the same origin web application to serve both HTTP and HTTPS requests and let the application determine which actions to take to secure communications depending on the incoming protocol. Fastly allows users to set this up to preserve this functionality within their servers. To set Fastly up to send HTTP requests to the non-secure service and HTTPS requests to the secure service, configure two origins, one each for the secure and non-secure ports, then set up the conditions under which requests will be sent there. In the Name field, type a name for the non-secure server (for example, Server Name (plain)). In the Address field, type the address of the non-secure server (for example, server.example.com). In the Transport Layer Security (TLS) section, set Enable TLS? to No. In the Name field, type a name for the non-secure server (for example, Server Name (secure)). In the Transport Layer Security (TLS) section, leave the Enable TLS? default set to Yes. To conditionally determine which server receives secure and non-secure requests, Fastly relies on the presence or absence of a specific header when the backend is selected. When an incoming connection is received over TLS, Fastly sets the req.http.fastly-ssl header to determine which server to use. Set a condition for this header on each origin by following the steps below. On the Origins page, click the Attach a condition link next to the name of the non-secure server. The Create a new request condition window appears. In the Name field, type the name of the condition specifying use of the non-secure server (for example, Use non-secure). 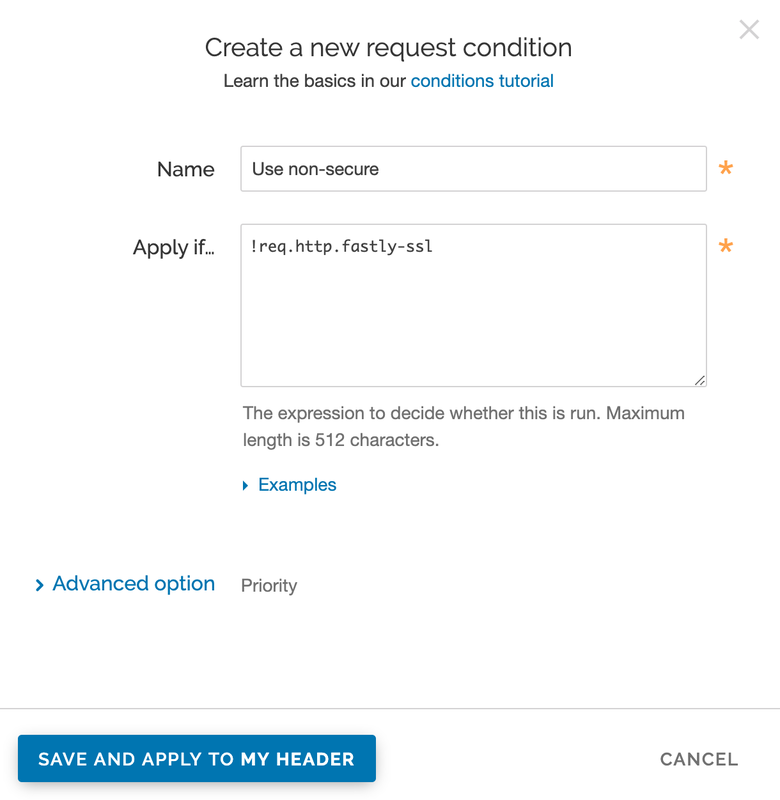 In the Apply if field, type !req.http.fastly-ssl. Leave the priority set to its default value. On the Origins page, click the Attach a condition link next to the name of the secure server. The Create a new request condition window appears. In the Name field, type the name of the condition specifying use of the secure server (for example, Use secure). 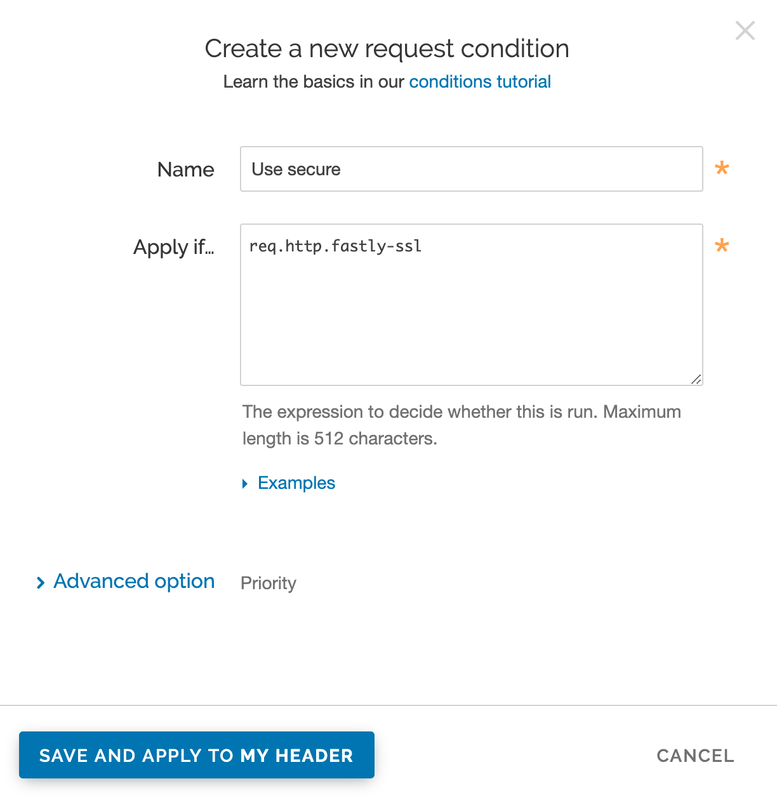 In the Apply if field, type req.http.fastly-ssl.